What Does “Holding Title” Actually Mean? First things first. In order to determine what holding title actually means, we first have to determine a definition of title in real estate. What is Title in Real Estate? Holding title is a way of legally saying you own something. Sometimes you hear the words “Title” and “Deed” used interchangeably, but these are actually two very different things. While title is the concept we use in real estate to define the actual ownership rights that someone has to a property, a deed is simply the document that gets recorded with the county and serves as evidence of who owns the property. Just to clarify, title is ownership, and a deed is a record of ownership. The concept of holding title can actually be applied to ownership of anything whether it be real estate, a car, or a pair of shoes. But, when it comes to big ticket purchases like real estate, which often involved multiple owners and lenders, defining someone’s ownership can actually become pretty complicated. This is why we talk about ownership of real estate in terms of “holding title”. In property law, title is defined by a bundle of rights that people or entities have to a particular property. Title to a property may not actually include all of these rights, and even the rights that are included can be restricted. In fact, sometimes these rights can be distributed to multiple people or entities and are often subject to restrictions, such as local laws and HOA covenants. Most of these restrictions “go with the land,” so when title is transferred from one person to the next, the restrictions will still apply to the new title holder as well. Let’s say Sharon owns a building and she leases it out to Jerry on a 10-year renewable lease. In this case Sharon legally owns the building, but she does not have the right of possession for that building. The right of possession has been legally transferred to Jerry in this case. Now, let’s say Sharon decides to sell the building to Henry, transferring title to him. While Henry now has legal title to the building, this title does not yet include the right of possession, as Jerry is still legally entitled to possess the property. The collection of rights that someone has to a property make up the bundle of rights and usually include the rights of possession, control, exclusion, enjoyment, and disposition. These rights can exist in varying degrees as properties are usually affected by at least some restrictions such as zoning laws, HOA rules, and other regulations. Ultimately, title is defined by the actual interest someone has to a property after considering all these restrictions and other legal obligations. Now, let’s go over the bundle of rights. Right of Possession – Whoever holds title to a property is generally considered to be the owner. So if you have a property deeded to you, it is all yours. However, there are a few caveats. If you fail to pay your taxes, mortgage, or sometimes your HOA dues, then you could end up having a lien put on your property. This would allow the court, bank, or HOA to take possession of your property in order to satisfy the lien. Right of Control – The property owner has the right to manage the use of their property as they wish, as long as it is within the confines of the law. If you want to build a stadium and hold a demolition derby in your backyard, you are free to do so… Unless of course there is a law or rule that prevents you from doing so. For example, there might be a rules about how many vehicles you can have on your property or how loud you can be. Not to mention, the law of the land (which your property is subject to) may have further licensing, permit, or insurance requirements for such activities. Right of Exclusion – This right generally has pretty robust protection in the United States. You don’t have to let anyone onto your property if you don’t want to, except for law enforcement with a warrant, of course. The right of exclusion also makes an exception for anyone with a legal easement to access your property. An easement is a specific right that someone else has to your property. It can be the legally granted right of a neighbor to cross your land with cattle, or drive through your land to access their own property, or any other use that has been granted to another party. One of the common easements is the right of utility companies to access private property in order to maintain their utility lines. Right of Enjoyment – As a property owner you enjoy the right to engage in any activity you want on your property, provided that it is a legal activity. Again, you can only hold that demolition derby if doing so does not involve violating any laws, ordinances, or association restrictions. Right of Disposition – The title holder has the right to sell, rent, or transfer ownership or use of the property at will. Again, there are exceptions for cases where there is a mortgage, tax, or mechanics lien against the property. 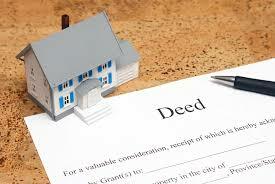 In most cases a lien needs to be paid off before a property can be sold, transferred or disposed of. Again, there can be multiple people who have an interest in, and therefore hold title to a property. Any right within the bill of rights can be held and transferred individually by separate parties (assuming the title vesting allows it). Also, as you read above, many of these rights can be subject to existing laws, covenants, restrictions, and other contractual agreements. As you can see ownership of real property is not exactly black and white. 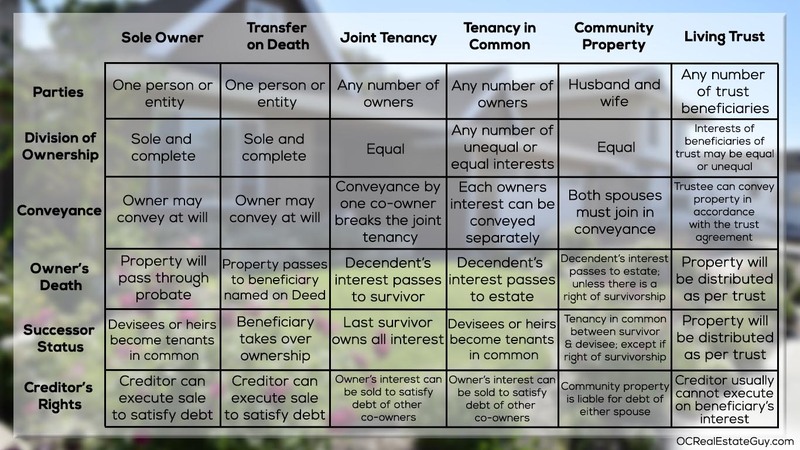 This is why we talk about ownership in terms of holding title, as the bundle of rights helps paint a more complete picture of what property ownership actually means. Vesting is the way that title is held. Title can be held by a single person, a married couple, a trust, or shared by complete strangers. While title defines what exactly is owned, vesting defines who owns it and how that ownership works. You can learn more about real estate vesting options in California here. Check out the diagram below to see the different options for title vesting. 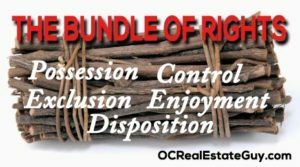 Posted in buying, Real Estate and tagged bundle of rights, definition of title in real estate, difference between title and deed, possession, right of control, right of disposition, right of enjoyment, right of exclusion, right of possession, title, title in real estate, title vesting, title vs deed, ways to hold title.